“WE NEED THE TONIC OF WILDNESS…,” prescribed Henry David Thoreau. If this is true, then Costa Rica could be considered the world’s 24/7 pharmacy. With 28 national parks and countless other wildlife refuges and nature reserves, over 25% of the country’s landmass falls under some sort of official environmental stewardship. If the looming winter season has you daydreaming of paradise from the confines of your cubicle, you’ll be sure to find Mother Nature’s remedy at one of the following national parks. Prior to its designation as a national park in 1978, this area was known as Cahuita National Monument. Before that, the bluff got its first national recognition when a former president, Alfredo Flores, was shipwrecked on its shores after visiting Sixaola just south of Cahuita. He was rescued, fed, and sheltered by the local fishermen. Flores reciprocated the gesture by purchasing the land, parceling it, building basic roads, and transferring the titles back to the people who’d helped him. This was the beginning of the modern Cahuita. Tucked in the southeastern corner of Costa Rica, Cahuita National Park is Costa Rica’s only national park that doesn’t charge admission, though donations (used to help maintain the park) are more than welcome. Explore the trails — keep an eye out for neon yellow eyelash vipers — or hire a local guide to take you out to some of Costa Rica’s best reef. Getting there: The quickest way to Cahuita is a half-hour flight from San José to Limón (four times a week), then a short bus or car ride (30 mins) down the coast. If you’ve rented a car, take Route 32 east out of San José for 96 miles to Puerto Limón, where you connect to Route 36 paralleling the Caribbean Sea. Head south for 7.5 more miles and the town of Cahuita sits on your left. Go through town and you’ll find the Kelly Creek Ranger Station entrance to the park on Calle Principal. You can also take the bus from the Atlántico Norte Terminal in San José at 12th St. between 7th and 9th Ave. straight to Cahuita. Manuel Antonio National Park is one of Costa Rica’s best-known parks, seeing 150,000+ visitors annually, despite also being the country’s smallest. It’s piqued the interests of international travelers and has been featured in Forbes as one of the world’s most beautiful national parks. It was established in 1972 after some turbulence with a foreign investor named Arthur Bergeron, who tried to privatize the area for commercial development. The community resisted his delusions of grandeur and the Costa Rican Legislative Assembly determined Bergeron’s actions to be illegal. Today in Manuel Antonio, there’s a well-maintained trail system where you’ll see troops of extroverted white-faced capuchins (heed your belongings). If you follow the trail that winds around Punta Catedral at low tide, you can see artifacts of the Quepoa tribe, who deployed wooden decoys to trap sea turtles in long stone pens just off Playa Manuel Antonio. The Quepoa — particularly the women of the tribe — were known as master archers and expert pearl divers. If you hoof it over to the mouth of the Río Naranjo, you’ll find a tiny rock island called Isla Mogote where the Quepoas’ shaman predicted weather patterns that informed seafarers and fishermen. Getting there: By car, take Route 27 west out of San José until, just before the coast, you jump on Route 34 south. Exit onto Route 235 and follow it for 1.5 miles into the town of Quepos. Turn left onto Route 618 from 2nd Ave. and continue for 4.5 miles to Playa Espadilla and the national park’s entrance. Or, catch a bus at Terminal Coca Cola on 16th St. between 1st and 3rd Ave. in downtown San José. 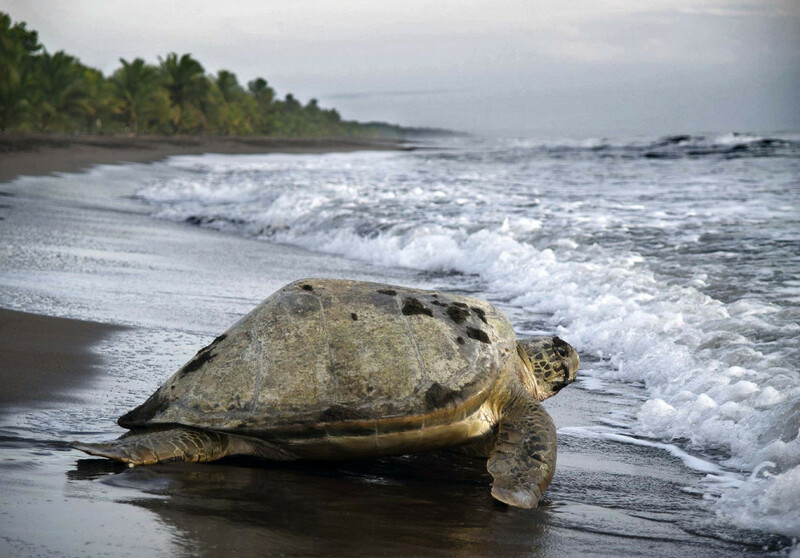 Tortuguero National Park protects multiple populations of endangered sea turtles. Despite the fact that Tortuguero National Park is only accessible by plane or boat, it’s still one of Costa Rica’s top three most-visited parks. Getting there will definitely be part of the adventure as you arrive in the town of Tortuguero via the Tortuguero River. If you know a little Spanish, it isn’t hard to guess where Tortuguero gets its name. The park protects over 20 miles of coastline where sea turtles arrive year after year to nest. July to October is prime season for hawksbill and green sea turtle nesting; leatherbacks arrive from February to April. Before its designation as a national park in 1972, Tortuguero was the site of some major logging by companies that sourced tropical hardwoods, floated them downriver, and processed them in mills. You can still see relics of the lumber industry, with some machinery here and there, but what you’ll notice even more is a major shift in attitudes concerning environmental protection. Since 1959, the Sea Turtle Conservancy (founded and directed by American scientist and conservationist Dr. Archie Carr) has promoted ecotourism and sustainable development in the area, which in turn has boosted the local economy. You can volunteer with the Sea Turtle Conservancy on various projects ranging from turtle monitoring to neotropical bird migration counts at the John H. Phipps Biological Field Station. Getting there: Getting to Tortuguero is a trip, unless you fly — there’s a daily 6am plane from San José’s Juan Santamaría International Airport direct to Tortuguero’s airstrip. Tickets are ~$100, and the flight only takes half and hour. Otherwise, you can take a two-hour bus ride from Calle Central and 15th Avenue to Cariari, then transfer to continue to Pavona. Boat services will be waiting in Pavona to shuttle you on to Tortuguero via the Río Suerte, which connects to the Tortuguero River. The boat ride takes approximately an hour, depending on the season, and costs ~$3 one way. If Tortuguero is the Caribbean’s unspoiled wilderness, Corcovado is the Pacific’s equivalent. The added adventure of getting there definitely pays off when you get the chance to see what nature looks like off the beaten path. Before the park’s establishment in 1975, the area looked destined to fall victim to international lumber companies. But after five years of successful lobbying, conservationists and motivated politicians secured its protection. The next battle came in 1980, when the region saw a boom in local gold mining operations. Not to be subverted, the government again rescued the area, ratifying legislation that ensured stricter protection and enforcement. Corcovado National Park is Costa Rica’s largest national park, covering about one-third of the Osa Peninsula in the southwestern corner of the country. This is dense tropical rainforest, so expect increased precipitation and moisture, especially if you’re planning a trip during the region’s rainy season (August through November). Being such a remote and well-preserved place, this is where the big jungle cats — like jaguars and pumas — reside, not to mention wild peccary, leatherback sea turtles, and caiman. Amenities are limited compared to options around other national parks, but several eco-lodges and tour operators can help fulfill your needs. Don’t forget essentials like reusable water bottles, insect repellent, rubber boots, and breathable clothing. Getting there: If you’ve rented a car, take Route 27 west out of San José. This becomes Route 34 (the Costanera Sur Highway) and runs south along the Pacific coast — take it until you connect with Route 245 in Chacarita. Follow this to the Osa Peninsula for ~50 more miles and you’ll reach the Corcovado National Park office in Puerto Jiménez. You can also catch a bus at 5th St. and 20th Ave. in downtown San José that will take you to Chacarita, where you’ll transfer for another bus to Puerto Jiménez, then into Corcovado. Total trip time via the bus: 10 hours. At the center of this national park in northern Costa Rica rises the mammoth that is Arenal Volcano, its enormity dominating the landscape for miles in every direction. When you think of volcanoes, this is what you think of — a massive base leading up to a conical peak with lava flow trails and tendrils of smoke whispering out of the topmost crater. It’s nothing short of stunning. However, if you want to get a clear sight of the peak, make sure to travel during the green season from May to November, when afternoon storms push away the clouds that normally enshroud it. Ever since its eruption in July of 1968, Arenal Volcano has been closely studied. The Smithsonian Institute founded the Arenal Observatory Lodge in 1987 as a scientific research outpost. For decades, it was possible to safely watch boulders launch and roll down the volcano’s sides, with the occasional lava flow illuminating its contours at night. Despite all this, in 2010 the volcano was designated as inactive. But before you let out a sigh (be it from relief or disappointment), take note that a flyover in 2013 revealed substantial thermal anomalies, which hint that Arenal is by no means extinct. Outfitters in the nearby town of La Fortuna offer a variety of excursions that take you on hikes through lava fields, around different craters, and to the 200ft La Fortuna Waterfall. Getting there: By car, take Route 1 north out of San José for 36 miles to San Ramón. From there, follow Route 702 north for 27 miles, then merge onto Route 141 for 12 more. Finally, turn left onto Route 142 for 13 miles and the park entrance will be on your left opposite a security checkpoint. Otherwise, public transportation options abound from downtown San José — they’ll take you to your destination in about four hours.